Where to find Sunshine Coast hotels near an airport? Where can I find hotels in Sunshine Coast that are near tourist attractions? 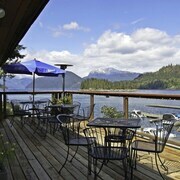 Embrace the sunnier side of life on a vacation to the Sunshine Coast. 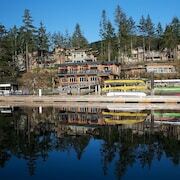 This bright spot in British Columbia offers easy, breezy fun just outside of Vancouver. In fact, many visitors arrive by ferry from the city. 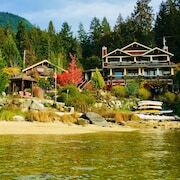 The Sunshine Coast includes Gibsons, Roberts Creek, Sechelt, Halfmoon Bay, Powell River, Secret Cove, Pender Harbour, and Earls Cove. The settlements collectively offer a variety of lakes, lagoons, sounds, docks, hiking trails, shops, restaurants, and cultural attractions. 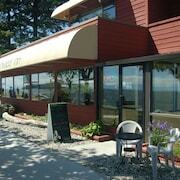 In addition, a bounty of beaches, canoeing routes, and wildlife attractions can be found here. Discover mountains, forests, cliffs, and tidal rapids on paths carved by the Strait of Georgia, Howe Sound, and Desolation Sound. This breathtaking region was first cultivated by the Squamish, Sechelt, and Sliammon communities. Their cultural influences are still seen in local artwork, totems, and cultural events. Shine some sun on your holiday plans using Expedia’s travel tips and deals on Sunshine Coast hotels. The fact that the Sunshine Coast is home to the largest population of artists in Canada is a testimony to just how inspiring its natural beauty is. Be prepared for an unmatched selection of hiking trails, water sports, golf courses, and beaches to choose from. The various communities here are patched together with velvet carpets of green spaces and hidden coves. The Sunshine Coast didn’t receive its name by accident. The region earns major points among visitors for providing wonderfully mild winters. Temperatures hover near 4 degrees Celsius for most of the winter. Summers tend to be dry and warm. Temperatures typically keep at a pleasant 18 degrees Celsius for the majority of the summer. Spring and fall keep in line with the trend of mild weather and sunny skies. 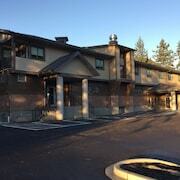 This is simply a great place to stay when you’re craving outdoor recreation any time of the year. Spread out your map and plant your pencil on Inland Lake Provincial Park, Sunshine Coast Trail, the rapids at Skookumchuck Narrows, and Chatterbox Falls. Do you have beaches on the brain? Head for Donkersley Beach, Haywire Bay, Saltery Bay Provincial Park, Shelter Point Park Beach on Texada Island, and Halfmoon Bay’s Welcome Beach. Leave room for a heritage walk in the Powell River Townsite. 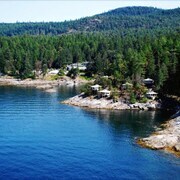 Of course, Desolation Sound Marine Park is a true delight for boaters. All these great attractions don’t even begin to scratch the surface of the multitude of hidden gems scattered throughout virtually every mile of the Sunshine Coast. Want to treat your family to a wonderful vacation without going over your budget? Cheap rates at luxury hotels are easy to find on Expedia.ca. Choose one of our amazing deals to book a Sunshine Coast hotel near the attractions you want to see most. Close the deal by adding our affordable Sunshine Coast flights to your vacation plans. Our travel experts are waiting to answer all your questions. Can you practically hear all the giggles and delighted screams you'll be enjoying as you go wild in the water? Grab the best rates at top Sunshine Coast hotels to put a smile on your face today. What are the most popular Sunshine Coast hotels? 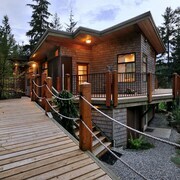 Are there hotels in other cities near Sunshine Coast? 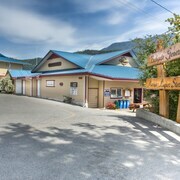 What other types of accommodations are available in Sunshine Coast? 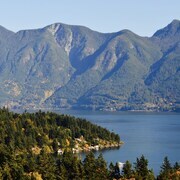 Explore Sunshine Coast with Expedia.ca’s Travel Guides to find the best flights, cars, holiday packages and more! Flights from Jean Lesage Intl. to Vancouver Intl. Flights from Winnipeg James Armstrong Richardson Intl. to Cancun Intl.